Why Restaurant Business Should Need A Mobile App? As we all know that mobile apps are too much beneficial for us. We can easily do our task with the help of mobile apps in an efficient way. The main reason for their popularity in the restaurant business is that it is basically used as the marketing tool through which your restaurant becomes popular among the people. It will not only enhance your business along with that it makes your social connections more strong. It will ultimately increase your customer base. The mobile app has many benefits such as security, easy to use, easy availability and many more. Here, in this article, we shed light on some point that justifies that nowadays app development service is very essential for the restaurant business. • Mobile Act as a Best Marking Tool: It is well known that to promote your business you require a perfect marketing strategy. Mobile apps are the best marketing tool in this digital era. The customer can easily know about your restaurant offers, menu, vouchers, gifts, etc. with the help of apps. A mobile-friendly website is the best medium to impact directly in the mind of people. The mobile app will act as a cost-effective tool for your restaurant business. • Enhance your sales Range: The main limitation of the restaurant business is that its sale is limited to the particular area. But this limitation is resolved with the help of mobile app development solutions. You can easily increase your sales among millions of people. Today’s youth prefer to order food directly from the mobile app rather than going restaurant personally. So, mobile apps is an essential requirement in the restaurant business to enhance their customer base. • It Increases Your Site’s Ranking: People can order through your restaurant if your site has lots of good reviews. Your site’s ranking also matters a lot. When you use a mobile app you can enhance your review with the help of push notification option. With positive reviews from your customer will certainly give you much more profit in your business. • Real-time and Easy Menu Access: People can order food from your restaurant when they feel convenient in order placing an order. You can make it easier with the help of using a drop-down menu in mobile apps. By this menu, the customer can easily search food as per their requirement. By easy menu, access customer can place orders instantly and rate your site in a positive way. • Easier and Quick Payment Process: Quick and easy payment experience matters a lot in any business. With the help of mobile apps, you can easily pay your bill in a secure and risk-free manner. There is no need of cash you can make your payment digitally. Mobile apps basically using POS system that is secure and efficient for payment process. All the above point clearly justify that mobile apps are very essential for the restaurant business. Mobile apps are an effective and efficient way to enhance your restaurant business and increase your user base. 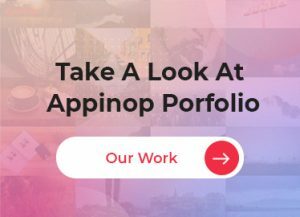 Appinop is a leading mobile and web app development partner which offers incredible apps for various industry verticals including Food & Restaurant. Our team is well experienced and skilled in the latest frameworks and technologies to deliver best-in-class food & restaurant apps for your business. Get in touch with our experts and share your project idea! How Food Delivery App is a Game Changer For a Food Delivery Business?